10 August 2012: Having become mayor following Jose Serra's resignation upon elevation to Sao Paulo state governorship in 2006, Gilberto Kassab represents one of Brazil's few parties of the right. In 2008 he became mayor in his own right, following his election victory over former Workers' Party mayor and tourism minister Marta Suplicy. Update 29 October 2012: Fernando Haddad won the run-off mayoral elections on 28 October and will take over from Gilberto Kassab on 1 January 2013. Though a native Paulistano, born in the city’s wealthy Pinheiros district in 1960, Kassab is of Lebanese descent. Kassab is the second mayor to hail from the city’s small Arab community, the most notorious being Paulo Maluf. One of the youngest in a family of seven, the son of a doctor, he obtained two degrees from the University of Sao Paulo, first as a civil engineer and then in economics, graduating in 1986. As such, Kassab’s political education came during the final years of Brazil’s military regime, when its grip on government was loosening and political parties began to flourish. This contrasts with his predecessors Jose Serra and Marta Suplicy, who both came of age under the dictatorship and were educated in exile. Kassab is not the first right wing mayor of Sao Paulo since Brazil’s resumption of democracy, in spite of its industrial past and the strength of the unions in the wider Sao Paulo state, the city itself has elected Paulo Maluf and his designated successor Celso Pitta, its first Afro-Brazilian mayor. Maluf’s two stints as mayor, first in the late 1960s as an appointee of the dictatorship and then in the mid-1990s following his election, were characterised by widespread corruption involving public works projects (for which he remains indicted, though now serving in the Brazilian Congress). Pitta was elected as mayor with Maluf’s endorsement, having acted as his financial secretary on the city council, with Kassab subsequently serving in Pitta’s administration, which also collapsed amid allegations of widespread corruption, ushering in Marta Suplicy’s mayoral term (the second for the Workers’ Party (PT) in the city). Kassab’s association with Pitta and therefore by extension Maluf was widely used by the Suplicy campaign in her failed re-election bid (the “return of the Pitta gang”), in spite of the fact that the mayoral candidate was actually Jose Serra (with Kassab as his deputy). 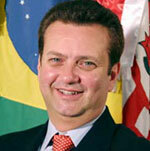 Kassab's political career began with his election to the city council in 1993 and then to the Sao Paulo state legislature two years later. He then ran as a federal deputy in the Brazilian Congress for the right wing Liberal Front Party (PFL, now Democrats) in 1998, re-elected in the 2002 elections which saw the PT's perennial candidate Lula finally become president. At local level, because of the sheer multitude of parties operating in the Brazilian system, pacts are often formed across the political spectrum, with Serra and Kassab leading the charge from the centre and right against the administration of Marta Suplicy, backed by the PT and other parties of the left. While Serra was successful in the poll, fought on Suplicy’s record as mayor, the PSDB lost control of the city council on inauguration in January 2005 when the council president defected amid scenes of chaos during the swearing-in ceremony. Serra’s first year as mayor was undermined by rumours that he would inevitably seek the presidency again in 2006, which under electoral law would require his resignation and the installation of his vice mayor, Kassab. While this prediction ultimately proved incorrect (his party chose Sao Paulo state governor Geraldo Alckmin instead), Serra was left to defend the fortunes of the PSDB by contesting the state governorship and therefore resigning as mayor. On Kassab’s assumption of the mayoralty, Sao Paulo joined its counterpart Rio de Janeiro as cities now under the control of the PFL. In a city of one-term mayors who usually encounter widespread public discontent over their time in office, Kassab angered many sections of the community with excessive rises in public transport fares, not least because of the long-delayed Expresso Tiradentes elevated bus route from the city's southern commuter district to the city centre which encountered massive construction cost over-runs. However, he circumvented this local quirk in 2008 when he became the first Paulistano mayor since the end of the dictatorship to receive a second term of office. Sao Paulo voters tend to be somewhat jaded over public works projects following past failures and pocket-lining. Kassab’s most prominent policy as mayor has been to take on advertising companies in the city for their obtrusively enormous displays, often featuring semi-naked models, which he calls “visual pollution”. In 2011 Kassab founded his own breakaway Social Democratic Party from the Democrats, attracting a significant number of defectors, including Serra’s 2010 vice presidential candidate Indio da Costa (himself a former PFL city official and councillor under the Maia mayoralty in Rio). The organisers of the World Mayor Project are looking for city leaders who excel in qualities like: leadership and vision, management abilities and integrity, social and economic awareness, ability to provide security and to protect the environment as well as the will and ability to foster good relations between communities from different cultural, racial and social backgrounds. The winner receives the artistically acclaimed World Mayor trophy, while the two runner-ups are given the World Mayor Commendation. Nominations were accepted until the 17 May 2012. A shortlist of 25 nominees was published on 18 June. Voting closed on 20 October 2012. The winner of the 2012 World Mayor Prize and other results of the World Mayor Project will be announced on 4 December 2012.